hey guys im chasing a floor pan for a 1982 fj40 swb landcruiser. any one know where i can get a fully body rubber kit? and does any one know anything about coverting the rear diff to discs? Just reading backwards through old posts and digging this up. Was a mates ute and he ended up selling it for $24k jeez it was nice/clean/mint/tough!!! BFT RANGER wrote: Hows this one on carsales. 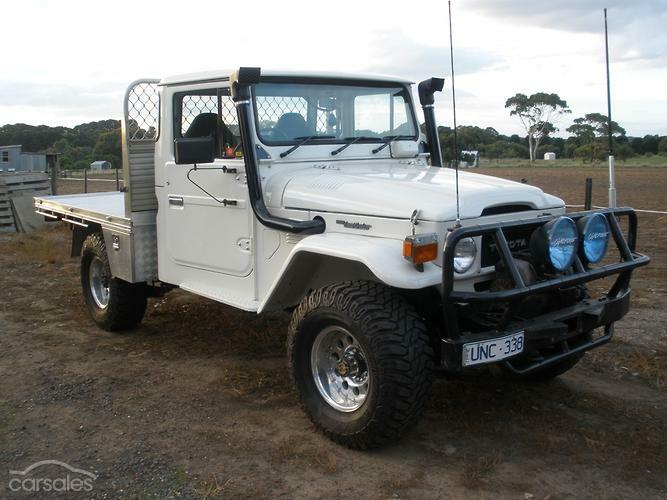 Hi guys after talking with a few 40 series owners In Australia on Facebook some of them reckon the FJ40's from the 60's in good low km condition are fetching good money.. BUT Diesel's did't start in Australia until the 70's.. So I'm thinking either a LOW km FJ40 and the last of the 80's FJ cruiser's are worth the most and are the most sought after..Like A 1982-84 BJ40 LX.. Most Common here in Australia would definitely have to be FJ45 ute's than the HJ45 ute with the 2H diesel's..Also it's getting hard to find rust free HJ47 Troopy's too!! Indy Hepburn wrote: So I'm thinking either a LOW km FJ40 and the last of the 80's FJ cruiser's are worth the most and are the most sought after..Like A 1982-84 BJ40 LX..
A '62? really that must be bloody rare! Does it have the toyota F engine or the chevy engine? As for the parts I would ask on the facebook groups as they are pretty good at knowing where stocks of parts are.